In this June 2010 photo, Rep. Karen Boback (R-Columbia/Luzerne/Wyoming) displays a flag presented in honor of fallen soldier 1st Lt. Michael J. Cleary, who was killed in December 2005 in Iraq. The personalized flag was bestowed by Honor and Remember to Jack Cleary, Michael’s father. The mission of Honor and Remember is to perpetually recognize all military lives lost in defense of our national freedoms. 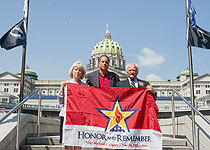 Pictured with Boback are George Lutz, founder and executive director of Honor and Remember, and Jack Cleary. The House Veterans Affairs and Emergency Preparedness Committee today approved Rep. Karen Boback’s (R-Columbia/Luzerne/Wyoming) legislation to officially recognize the Honor and Remember Flag as a symbol of the service and sacrifice of the brave men and women of the United States Armed Forces who have given their lives in the line of duty. House Bill 385 would establish the Honor and Remember Flag as an official Pennsylvania emblem for fallen soldiers and would require the flag to be permanently placed in Soldiers’ Grove, near the state Capitol. The House Veterans Affairs and Emergency Preparedness Committee, of which Boback is a member, unanimously supported the legislation. Boback noted that she also has been appointed the chairman for the Subcommittee on Military and Veterans Facilities, which is under the auspices of the Veterans Affairs and Emergency Preparedness Committee. As chairman, she conducts hearings to consider legislation and investigates issues pertaining to state-run military and veterans facilities, such as Fort Indiantown Gap, Pennsylvania’s six veterans’ homes and 90 armories in 50 counties.